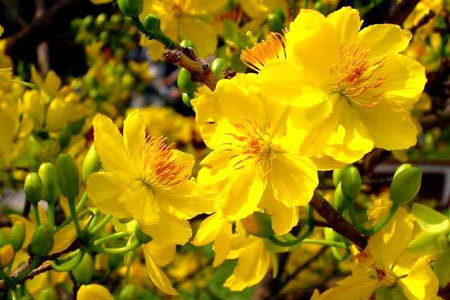 If the peach flower is the symbol of Tet in the north, then the yellow apricot flower is its counterpart in the South. The yellow apricot flower belongs to the family of hoang mai (meaning “yellow apricot” in Chinese), which is a forest plant. The trunk and sprigs of the yellow apricot flower are suppler than those of the peach plant. The flowers grow in bunches and have stalks that hang loosely near the branches at the side of the leaves. The flowers are yellow and their scent is modestly secretive. The leaves of the yellow apricot flower fall in the winter. There are varieties of yellow apricot, including mai tu qui (apricot of all seasons) and nhi do mai, which begin to produce red coloured fruit after blossoming. Mai chieu thuy, the aquatic variety of apricot flower, have small leaves and small flowers that blossom in white, scented bunches. Mai chieu thuy, which blossoms in the spring, is generally planted in small rock gardens. Its trunk and branches are trimmed and bent so that it becomes a sculptured plant.